At DerbyCon 8 (2018) over the weekend Will Schroeder (@Harmj0y), Lee Christensen (@Tifkin_), & Matt Nelson (@enigma0x3), spoke about the unintended risks of trusting AD. They cover a number of interesting persistence and privilege escalation methods, though one in particular caught my eye. Lee figured out and presents a scenario where there’s an account with unconstrained delegation configured (which is fairly common) and the Print Spooler service running on a computer, you can get that computers credentials sent to the system with unconstrained delegation as a user. We find that about 90% of the environments we review and work in have some sort of Kerberos delegation configured and about 75% have unconstrained delegation configured. I identified and highlighted the security issues with unconstrained delegation in my talk at Black Hat in 2015 (as well as subsequent talks) and in a post here. The attacker discovers a system with Kerberos unconstrained delegation and compromises it. Then the attacker sends a “RpcRemoteFindFirstPrinterChangeNotification” request to the Domain Controller and the DC responds to test communication to the requester. If the Domain Controller is running the Print Spooler (Spooler) service, this will work (and it’s trivial to test to find 1 DC that is running this service). 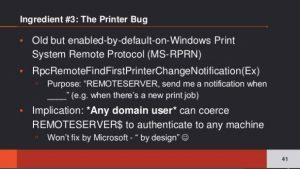 Lee explains that the issue is that any authenticated user can remotely connect to the Domain Controller’s print server (spooler service) and request an update on new print jobs and just tell it to send the notification to the system with unconstrained delegation. It will test that connection immediately thus exposing the computer account credential (since the print spooler is owned by SYSTEM). Lee notes that Microsoft says this is by design and “won’t fix”. Lee posted PoC code he calls SpoolSample on Github. Attacker discovers and compromises a system with Kerberos unconstrained delegation. Note that if an attacker compromises a Domain Controller in a trusted forest (with a 2-way trust), this can be used to compromise the other forest. Attacker tests for and discovers a Domain Controller running the Print Spooler (Spooler) service. Attacker sends the MS-RPRN request RpcRemoteFindFirstPrinterChangeNotification (Kerberos auth) to the DC’s print server. The DC immediately sends a response to the requester. This response involves the DC creating a Kerberos service ticket (TGS) which contains the Domain Controller’s computer account Kerberos authentication ticket (TGT) since Kerberos is involved and the requesting account is configured with unconstrained delegation. The attacker now has the Domain Controller computer account Kerberos TGT which can be used to impersonate the DC. DCSync all account credentials (or other attack involving DA credentials as desired). Domain Controller running as a print server (Print Spooler service is running). This issue also works across forest trusts. Note that this post focuses on Domain Controllers, but any server is potentially at risk to this attack. Mitigate this specific issue by disabling the Print Spooler service on all servers that don’t need it running and ensure there are no accounts with unconstrained delegation configured. Microsoft has released some additional guidance for the cross-forest impact of this issue. Microsoft has changed this to CVE-2019-0683 and will fix. The Microsoft article 4490425 describes the changes to trusts moving forward to protect against this issue. Great talk Will, Lee, & Matt! Just a word of warning, the “DFS Namespace” service on DCs depends on the Remote Registry service. Given that Sysvol replication is via DFS-R nowadays, the recommendation to stop Remote Registry should be taken with caution and much testing. Agreed. I have removed that part of the recommendation to avoid confusion. Post Updated. One thing to note though is that the Print Spooler Service is required for Printer Pruning. Good point. I rarely see this needed, but I’m sure there are some environments with this configured.